You will find how to crochet granny square directions on this page. The directions are step by step (our online crochet classes) and will help the beginner to the square required for the blanket. This is just another example of a basic granny square pattern transformed into a beautiful gift. Suitable for beginners. 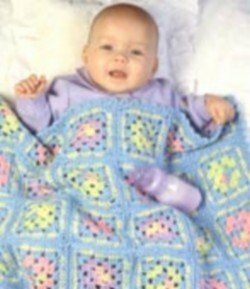 Blanket measures approximately 25" x 37"
RED HEART® “Soft Baby”, Art. E705 (7 ounce solid/6 ounce multicolor skeins): 11/2 Ounces No. 7958 Frolic CA, 1 ounce each No. 7725 Pinkie CB, 7624 Lime CC, No. 7588 Lilac CD; 8 ounces No. 7822 Sky Blue CE; and 2 ounces No. 7221 Banana CF. Crochet Hook: 4mm [US G-6]. Yarn needle. GAUGE: Square measures 41/4" x 41/4". CHECK YOUR GAUGE. Use any size hook to obtain the gauge. NOTE: Always attach new color with right side facing. SQUARE 1 (Make 18): With CA, ch 4; join with a sl st to form a ring. Rnd 1 (Right Side): Ch 3, 2 dc in ring, [ch 2, 3 dc in ring] 3 times, ch 2; join with a sl st to top of ch-3. Fasten off. Rnd 2: Attach CB in any ch-2 sp; ch 3, (2 dc, ch 2, 3 dc) all in same sp, ch 1, [(3 dc, ch 2, 3 dc) all in next ch-2 sp, ch 1] 3 times; join. Fasten off. Rnd 3: Attach CE in any corner ch-2 sp; ch 3, (2 dc, ch 2, 3 dc) all in same sp, ch 1, 3 dc in next ch-1 sp, ch 1, [(3 dc, ch 2, 3 dc) all in next ch-2 sp, ch 1, 3 dc in next ch-1 sp, ch 1] 3 times; join. Fasten off. Rnd 4: Attach CF in first dc of the 3-dc group before any corner ch-2 sp; ch 1, sc in first 3 dc, * ch 3, skip ch-2 sp, [sc in next 3 dc, ch 1, skip next ch-1 sp] twice **, sc in next 3 dc; rep from * around, end at **; join with a sl st to first sc. Fasten off. Rnd 5: Attach CE in same sc as joining of Rnd 4; ch 1, sc in first 3 sc, * working over the ch-3 of Rnd 4, (2 dc, ch 2, 2 dc) all into ch-2 sp of Rnd 3, [sc in next 3 sc, working over the ch-1 of Rnd 4, dc in next ch-1 sp of Rnd 3] twice **, sc in next 3 sc; rep from * around, end at **; join to first sc. SQUARE 2 (Make 18): Work same as Square 1 EXCEPT work Rnd 2 with CC. 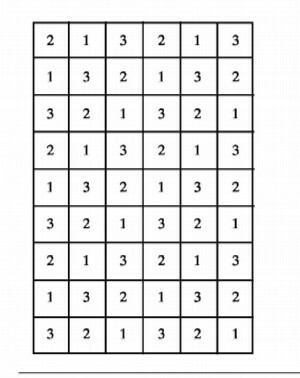 SQUARE 3 (Make 18): Work same as Square 1 EXCEPT work Rnd 2 with CD. FINISHING: Sew Squares together through back lps following diagram. Edging-Rnd 1: Attach CE in upper right corner ch-2 sp; ch 1, ** 3 sc in corner ch-2 sp, sc in next 15 sts, * sc in next ch-sp, sc in seam, sc in next ch-sp, sc in next 15 sts; rep from * to next corner; rep from ** around; join to first sc. Rnd 2: Ch 1, ** (sc, [ch 3, sc] twice) all in next (corner) sc, skip next 2 sc, * (sc, ch 3, sc) all in next sc, skip next 2 sc; rep from * to next corner sc; rep from ** around; join. A, Color B, Color C, etc. ; ch = chain; dc = double crochet; lp (s) = loop (s); mm = millimeters; rep = repeat; rnd = round; sc = single crochet; sl = slip; sp = space; st (s) = stitch (es); yo = yarn over; * = repeat whatever follows the * as indicated;  = work directions in brackets the number of times specified. Permission is granted by Coats and Clark to use this pattern.